The diverse coastal habitats of the spectacular Pacific Coast include sandy beaches and dunes, salt- and freshwater marshes, coastal prairies and bluffs, riparian woodlands, and coniferous forests. 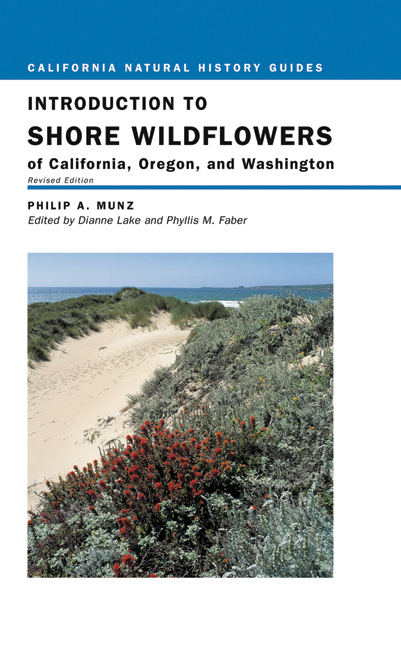 This guide, first published nearly forty years ago, has introduced thousands to the wildflowers and other plants that grow along the coastline. Now thoroughly updated and revised, it is the perfect field guide to pack for a day at the seashore anywhere in California or the Pacific Northwest. Philip A. Munz (1892-1974) of the Rancho Santa Ana Botanical Garden was Professor of Botany at Pomona College, serving as Dean for three years. Dianne Lake is Rare Plant Committee Co-Chair and Unusual Plants Coordinator at the California Native Plant Society, East Bay Chapter. Phyllis M. Faber is General Editor of the California Natural History Guides.